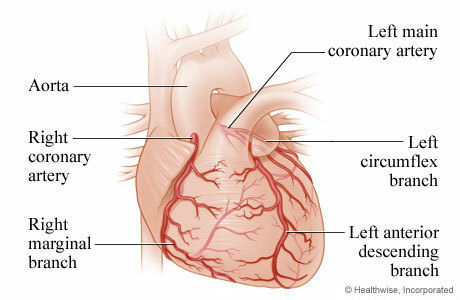 Coronary artery disease, also known as coronary heart disease, is the leading cause of death in the United States. Though there is no cure, it’s often manageable through lifestyle changes such as a more healthful diet, regular exercise and quitting smoking. Chest pain or tightness is often the first sign of coronary artery disease. This discomfort, known as angina, can spread to the jaw, neck, back, arms and other parts of the body. Pain often intensifies with physical activity or an emotional event. Rest or medication (nitroglycerin) usually relieves the pain. When plaque accumulates in the wall of coronary arteries that bring blood and oxygen to the heart, these small blood vessels begin to narrow. The plaque buildup, which includes cholesterol and other substances, can eventually block blood flow to the heart. If the heart muscle gets inadequate amounts of oxygenated blood, you might begin to feel the first signs of coronary artery disease. Beyond angina, the disease might weaken the heart enough to cause more serious conditions such as heart failure (when the heart loses its ability to pump blood efficiently) or an irregular heartbeat, also known as arrhythmia. Some risk factors, such as family health history, are irreversible. But lifestyle changes can prove lifesaving when a healthful diet and exercise are combined with stress management. Excess weight, poor diet, a sedentary lifestyle and smoking each increases the risk of coronary heart disease. Your doctor will want to establish a baseline, measuring blood pressure, sugar levels and cholesterol. Echocardiogram: An ultrasound test that uses a transducer to send out high-frequency sound waves toward the heart. The device, when moved over the chest and abdomen, turns the echoes of sound waves redirected from various parts of the heart into detailed images of organs, blood flow and tissues. Coronary angiogram: A type of X-ray that determines, by detecting dye injected with a cardiac catheterization – a procedure that uses a long tube called a catheter placed in an artery or vein to reach through blood vessels to your heart – if your arteries are narrowed or blocked. Trans fat, or trans fatty acids: Foods with hydrogenated oils and fats. Check the labels on baked goods, crackers, stick margarine and other foods. Aside from lifestyle changes, your doctor might prescribe medications for coronary heart disease or high (LDL) cholesterol or, if that fails, surgery. Medications: Lipid-lowering statins are the only effective drugs against coronary artery disease. Regular use of aspirin, often the low-dosage baby type, can help lower the risks of both angina and a heart attack. Medications are also available to lower your blood pressure and prevent blood clots that can lead to a heart attack or stroke. Calcium-channel blockers, which widen coronary arteries, lower blood pressure by increasing the blood supply to the heart. Beta blockers and ACE (angiotensin-converting enzyme) inhibitors also lower blood pressure. Nitroglycerin, another drug that widens coronary arteries, is often prescribed to control chest pain. Many physicians are reluctant to prescribe statins because of side effects that can include liver problems, muscle aches, memory loss and diabetes. But Dr. Paul Thompson, chief of cardiology and co-physician-in-chief of the Hartford HealthCare Heart & Vascular Institute, says such fears should not discourage anyone from taking statins. Dr. Thompson, in an article in the Journal of the American Medical Association, cautioned that patients who take 80 percent of their statin dose have a 45 percent greater chance of dying than patients who take the prescribed dosage faithfully. "Yet thousands of patients avoid these life-saving medications," he wrote, "because of the presence of, or concern about, possible statin-associated adverse effects." The Hartford Hospital Cardiac Catheterization Laboratory’s coronary angioplasty program is the largest in New England for treating coronary arteries that have been blocked completely for extended periods. These chronic total occlusions, or CTO, typically did not respond to angioplasty. Coronary thrombectomy: Used when a coronary blockage includes a blood clot, or thrombus. Thrombectomy catheters, equipped with a suction feature, remove the clot before a balloon angioplasty and stenting. Coronary atherectomy: For blockages so hardened that neither a balloon nor a stent can expand fully during an angioplasty procedure. The drilling motion of devices like the rotational atherectomy catheter – this one has a diamond tip – breaks through extraordinarily dense plaque. Hartford Hospital also uses newer technology, the Diamondback catheter, that features a brass burr embedded with diamond dust to cut through plaque buildup in an orbital motion. Cutting balloon: The cutting theme continues with this device, which uses thin razor blades to slice through plaque and give your narrowed artery some needed elasticity to accommodate a stent.